The Canadian Fishing & Hunting Map is designed & distributed annually by the Patricia Regional Tourist Council to promote Canada's Heartland in Ontario. Our most recent issue presents you with an enormous amount of information about our famous fishing & hunting area in Northwestern Ontario Canada and our 200+ Lodges and Outfitters. This map has been produced for over 50 years to help tourists, fishermen and hunters better choose their destination. 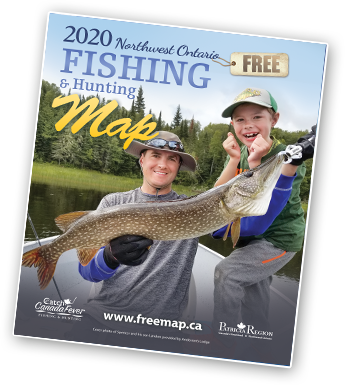 To receive a FREE copy of the newest / most up to date Canadian Fishing & Hunting Map fill out a request form on line and we will mail you this year's Map to the address you provide us at no charge. To get your copy of the current map go to our fishing map request page. Information on all our outfitters & allied business members is available online from our database. The database gives you a pretty good idea of what services they each offer, what species of fish you can catch around the area and their contact information if you need specific assistance. You can also locate all of our outfitters and many of their outposts camps as well as our allied businesses on our online maps. Because of the number of camps in the Patricia Region, the online version of the Canadian Fishing Map is divided into four main geographic sections, with separate maps for the various towns as well. The area maps are composite map/satellite views and you can zoom in and get some idea of the size of their lakes. The town maps are straight maps and can be used to navigate these communities......Have fun. The Patricia Region Tourist Council is proud to have partnered with the Mills Fleet Farm family, who are able to provide you with your copy of our Free Canadian Fishing Map & Hunting Guide, from any one of their 31 store locations.To view a map that provides the Fleet Farm store locations in the Upper Midwest USA, please click here Be sure to stop by any one of their locations to pick up your copy of the most recent edition of the Free Canadian Fishing Map & Hunting Guide. Mills Fleet Farm has been proudly serving the Upper Midwest since 1955 with high quality merchandise you won't find anywhere else. They are your full-service supplier for life, work, home, and recreation - combining wide-ranging products, convenient services and friendly, knowledgeable personnel all under one roof. After over 50 years in business, Mills Fleet Farm has become the region's most trusted name in retail with 31 locations across Minnesota, Wisconsin, Iowa and North Dakota. Now in their third generation of family ownership, they remain committed to their founding values: honesty, integrity, hard work, service and loyalty to their customers and partners.